Marshall Amplifiers and rock music go way back, and Alfred Music Publishing, is distributing a new book featuring the story of Marshall’s iconic first combo amplifier, entitled: The Marshall Bluesbreaker, by John R. Wiley. The Marshall Bluesbreaker is the perfect gift for any guitar enthusiast or fan of Marshall guitar amps. The entire history of the Bluesbreaker amp is told, including the development of the JTM45 and how Eric Clapton requested the first Marshall combo. The book offers a complete listing of the Bluesbreaker components as well as a comprehensive timeline of year-by-year specifications and changes to the amp, including reissues and limited editions. The book also includes listings and specifications on modern builders who offer replica and clone amplifiers based on the Bluesbreaker and Mini Bluesbreaker designs, a step-by-step guide on converting a stock Marshall Bluesbreaker Reissue into a Clapton-spec Bluesbreaker, and 16 pages of color photos, featuring original and reissue Bluesbreakers, Mini Bluesbreakers, and Bluesbreaker components. 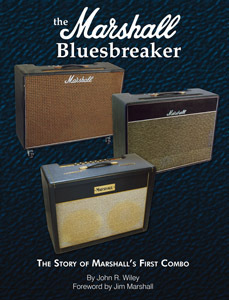 The Marshall Bluesbreaker is now available in book format for $29.95. Pick up your copy at a local music retail store, or buy it today at www.alfred.com.